Along the banks of the Yuba River, history has seen waters run full and clear, it has seen the wild west rise and fade, it has seen skies with golden sun, and earth with golden ore. The Yuba River carries thousands of stories in its flow, and through time, it has carried promises of riches for thousands of seekers and dreamers. Today, the Yuba River still calls to its waters the dreamers among us, the ones who look for deeper meaning in the simplest of things. In this spirit, Gather Jewelry is proud to release a uniquely fresh series of jewelry – an exclusive collection that hits close to home. Built around a collection of rocks harvested from the Yuba River itself, the Yuba River Collection is a testament to the power of nature and the beauty of home. Each rock is gathered at the river, then cut and polished until it's ready to be set in sterling silver. The result is an exhibit of pieces that speak proudly and purely of this small corner of the world, and of the river that runs through it. 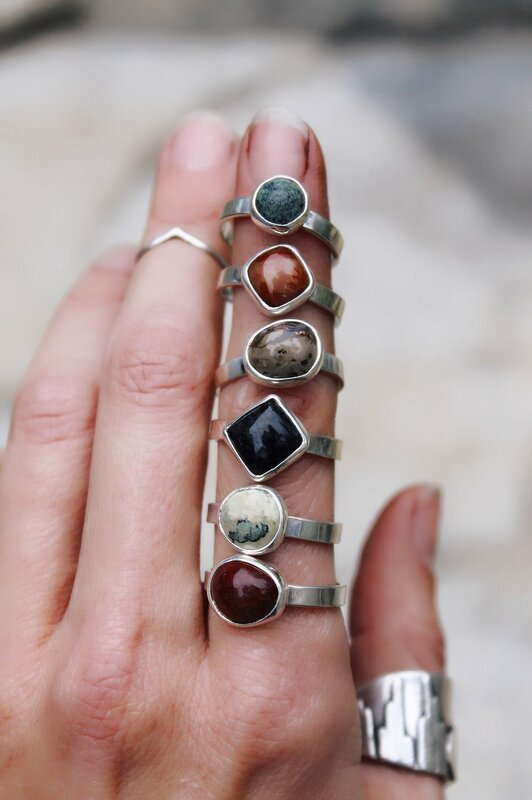 By crafting these stones into wearable pieces of jewelry, Gather is giving people both near and far an opportunity to (literally) carry the Yuba River close to their heart. 10% of each piece sold from the Yuba Collection will be donated to South Yuba River Citizen's League. Limited quantities of these one-of-a-kind pieces are made in small batches and released back out into the wild, sporadically and seasonally. Follow @gatherjewelry on Instagram and sign up for the email list for updates.